It began with Eragon . . . It ends with Inheritance. I’ve been waiting nearly eight years to read the conclusion to the Eragon series. My mother pointed me toward the first book in the series in 2003, while I was home on a school break. 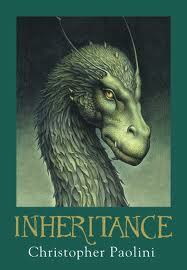 I was immediately fascinated and drawn into the world of Alageisia and young Eragon and his Dragon, Sapphira. I was doubly impressed on finding out that the author, Christopher Paolini had finished the first draft of the book when he was only 15 years old! What a feat! Years passed and I read the second book in the series, then the third. I didn’t love the third book and was almost of a mind to skip book four, being so disappointed by the previous book. Boy oh boy, I’m glad I picked up book four! Book four was everything book three ought to have been. It was a beautiful way to end this epic fantasy series. Everything was well thought-out and nothing felt easily arrived at or thrown together. The characters and the integrity of the world Paolini created were all respected with this concluding novel. Obviously, some time has passed since the first draft of the first book, and Christopher Paolini’s maturity really shines through in this last book. Without giving anything away, I LOVED the resolution between Galbatorix and the Varden/Eragon (and his allies). It was beautifully done. It really, really spoke to me. I *may* have cried. If only we could give to our foes in life the gift that Eragon gave to Galbatorix! While I would have loved a bit more resolution given to a couple of the budding love subplots, I commend Paolini for not taking the “easy way out” on those storylines. In my mind’s eye, everything ended as realistically as it ought to have done. (For a magical, fantasy world, of course!) I would love to see Paolini’s next project include a proper love story. The first 1/3 of the book really took me a while to get through – about two weeks (seriously unusual for me) of slow reading. I should have re-read book three before jumping in, in order to get back into the language/names, etc. But as I mentioned earlier, I hated book three, so I didn’t re-read it. That said, at around the 1/3 mark, I became intensely involved with the storyline and finished the rest of the book in three days! Couldn’t put it down! Great read. Great conclusion to an immensely impressive series. If you haven’t checked out the Eragon series yet, you really should! This book is a bit more “high fantasy” than I usually read, but not so demanding or as high fantasy as Anne McCaffrey or Tolkien. If you enjoyed the Inkheart series, you'll most likely enjoy this series. Fabulous review! I'm not a huge fantasy reader, but this series makes me think I have to make an exception. I totally need a good fantasy series, and I know this will be it! It's a HUGE series though! The books are like 800 pages each! Maria - wasn't it grand? My heart hurt for Arya and Eragon, but I really think the way it ended for them was the right choice. I definitely wanted more for Murtagh! Would love to see a follow up for him. Glad you enjoyed it too! Emidy - Thanks! I hope you check these books out, they're really quite cool. Happy reading!